French Press coffee was introduced in 1920s and since then it has systematically grown its popularity. 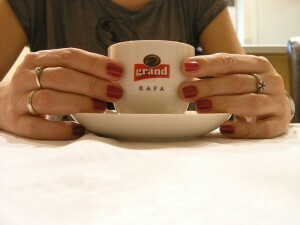 Today it is one of the most popular types of coffee. 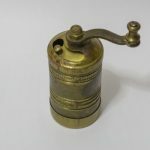 But finding a coffee grinder for Frech Press can be a difficult task. When grinding coffee for French Press, you need a consistent coarse grind. 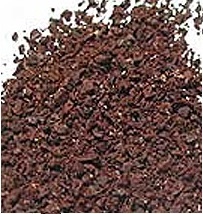 Many coffee grinders do not produce such grind despite being marketed as suitable for French Press. There are some important features that a grinder which grinds coarse grind well must possess. 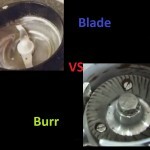 Burr coffee grinders are always preferred against blade coffee grinders. Furthermore, even if your grinder is good for coarse grinding, you will want to make sure it will always suit your taste. Because there are many variables that affect the grind, you might want to have many steps of adjustment. This will assure you a lot of choice of grinding, which will suit your taste best. Consistency of the grinder is another feature of vital importance when grinding for French Press. If the grinds are not consistent, the final coffee taste will not be the one that you desire even if you have the most high class coffee maker. Also the grinders with better consistency have better motors and more quality components. They are also better engineered. Consistency plays the biggest role when determining the price of coffee grinder for French Press. The higher the consistency, the higher the price in general. Cleanness: It is important for all kinds of coffee, but if you have grinder with a lot of old grounds in it which also have uneven particles, that will change the aroma and flavor of your coffee. It is therefore wise to purchase a coffee grinder that is as clean as possible. Easiness to clean: Every coffee grinder has some grounds collected. Cleaning will always be a problem. It is good to have a coffee grinder that is easy to clean since cleanness is an important feature of the best coffee grinder. Static: When grinding coarse, static problems might occur. To decrease static, it is good to have a bit more quality models with slower motor rotation and better materials. They might cost slightly more, but static can be a problem otherwise. Other standard features of the coffee grinder such as timer, longevity, bean hopper size, exterior, etc. are also important, but those are the features that affect the coffee for French Press the most. This is a major issue when grinding. A French Press coffee needs a relatively coarse grind. If the grounds are too fine, that will lead to bitter taste of your coffee. If the grounds are too coarse, that will lead to weaker coffee, because most of the flavor is held by larger grounds. So this makes the right ground harder to determine. Below is the picture of how coarse the coffee grounds should be. It is a hard method to grind and some previous experiences with grinding will come handy. That is why it is recommended to buy a grinder which already has a coarse setting which will make the process easier at start. But as a general rule of thumb, if you have 10 grind settings, from 1 (the finest) to 10 (the coarsest), French Press would be around 6 to 8. For most grinders it holds that the higher the price, the more quality they are. It is hard to find a coffee grinder for French Press coffee that will create a consistent cup of coffee for less than 100$. Of course many are marketed as sufficient, but consistency will be a problem. The best grinders for this method can cost more than 500$. They provide you with most consistent grind, very little static and are very clean. However some mid-price range grinders are also available for smaller price which do the job good as well. They grind consistent and are not so hard to clean. Another mention is about manual burr grinders. They are usually less expensive, but for coarse method many of them have problems in form of inconsistency and clogging. It is good to pay attention to these issues. Not all the grinders which say that have settings for coarse grinding will actually grind well at those settings! Below are the top 5 coffee grinders for French Press. They are in the price range 50-250$. Zassenhaus coffee grinder 156BU is a German manual burr coffee grinder. It is especially good for making French Press coffee. The grinder produces very little static and it is not hard to clean. It is not the cleanest grinder though, but with a bit of effort you can clean it well. It is also possible to adjust the grind to different steps of adjustments; from fine to very coarse. With this grinder, you are able to adjust the grind to your size. The grinder has stainless steel conical burrs and 25-year guarantee on grinding mechanism which ensures the quality and durability of the product. This coffee grinder might last for decades before it brakes. Consistency of the grinder is very good when making French Press coffee. It will produce even grinds. Price is also very good for the consistency that the grinder provides. For around 100$ you get a decent grinder with which you will get consistent coarse grinds. The design looks old-fashioned like with most other grinders. The downside is that it is manual burr grinder, which means that you have to grind by hand and that it has rather small grind drawer. This will take a lot of time and effort from your side and you will not be able to grind a lot at once. However, if this does not bother you, it can be a perfect grinder for you. It is also rather small, so you can take it to the camping trip or just on vacation. This is another manual burr coffee grinder. It is made in Japan. The grinder is equipped with ceramic burrs and stainless steel housing. Burrs are also easy to clean. Moreover, this grinder is very quiet and produces very little static. It has the capacity of 25 grams of coffee beans. It is possible to adjust it to different grind sizes, which enables you to pick up the coffee of your taste. The grinder is made of good materials, so it is durable. It is also easy to clean, which is another important factor when making French Press. Consistency is quite good for French Press. Although it might have some issues at very coarse grind, they will disappear with regular cleaning. Its price is less than 50$, which is very cheap. This grinder is good for this price range. The downside is that it is hand grinder, meaning that it will take you a long time and energy in order to grind coffee beans. Because of its smallness and light weight (140 grams or 5 ounces), it is perfect for camping trips. 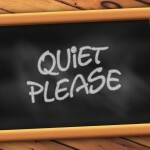 Quietness assures that you will not wake anybody up when grinding. If you prefer larger grinders, there is also tall version of Porlex available. All in all, it is a good grinder for cheap price. Therefore it will give you good grind, but do not expect miracles from this grinder. This is a great electric burr coffee grinder for French Press. It has 16 steps of adjustments. This is not a lot, but it is enough to find a suitable adjustment for coarse grind. It has conical steel burrs which are easy to clean because of the removable upper burr. Its gear reduction motors ensure less static build-up. But on the other hand, it has no anti-static coating, which makes the grounds jump around. This means that static problem does exist, especially in a very dry climate. It also has a grinder to simplify your grinding. The design is elegant and user friendly. The grinder is also very quiet. Consistency of Capresso Infinity is good. Also the price you pay for it is not bad – less than 100$ for electric burr coffee grinder is a good bargain. The design looks good and it is also small, which is good, because it will not take too much space in the kitchen. Bean hopper capacity is 8.8 ounces (275 grams), which is enough for home usage. To sum up – it is a good grinder for a lower price range. It is not manual, meaning that you will not have to spend minutes to grind a single cup of coffee. Its quietness will also assure you will not wake up anybody in the morning. Note: There is also a bit more expensive Capresso Infinity 565 with steel exterior, which just decreases the loudness. In case you really hate loudness, that one is one of the quietest if not the quietest electric coffee grinder on market. This grinder is very popular for a good reason. It has 40 mm hardened steel conical burrs. With 40 steps of adjustments, the grinder offers you a wide grinding range. It is possible to grind many different methods, French Press being just one of them. Burrs are easily removable, so the cleaning is easy. 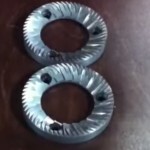 It has a gear reduction, which reduces the speed of grinding. Besides slower speed, there are also anti-static properties in the container, which minimizes the static build-up. The design is elegant and it is easy to use. Manuals are very helpful and on top of that customer service is very good as well. Consistency of Baratza Virtuoso is very good, not just for French press, but also for all other methods. It is the mid-price range grinder – it costs slightly over 200$. It is one of the most popular models because it provides you with a good quality for a given price. Other good features are a useful timer and 8 ounces (250grams) of bean hopper capacity. This simplifies your grind and also gives you enough space for beans if you grind at home. It is also quieter than most of the grinders in the same price range. The grinder is perfect for home use and it is one of the best coffee grinders on market for making French Press. This is another popular grinder. It is good for grinding on many different methods. It is an improvement of Breville smart grinder. Stainless steel conical burrs provide you with good grind. They are also quite durable and upper burr is removable which enables easy cleaning. 60 steps of adjustments enable grinding on many different methods and enable you to set the grind that matches your taste best. It grinds slowly and has good anti-static properties. This results in almost no static build-up. The design of the grinder is nice and it comes with a handy manual which makes it easy to use. Besides manuals there are also YouTube videos provided which help you learn how to use that grinder. Consistency is very good at Breville smart grinder PRO. 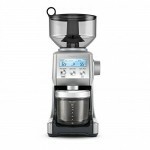 It is at the similar price range as Baratza Virtuoso and has good price to quality ratio. The timer has also a pause function, which makes it different than other grinders. Removable bean hopper allows you to remove bean hopper with beans still in it. This is useful feature if you grind a lot with different kinds of beans. It is also very spacious – it holds 1 pound (450g) of beans. As other grinders that have low static, this one too is very quiet. It is definitely one of the best coffee grinders for French Press.